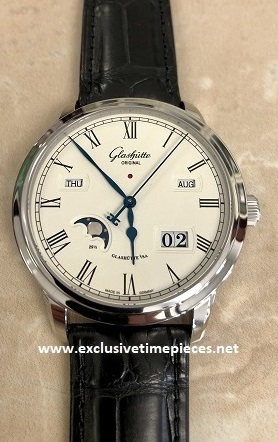 New, with original Glashuette Original box & warranty papers. Beautiful high polished stainless steel, 40mm case, automatic movement, with Moonphase, and glass exhibition case back. Available on elegant alligator leather strap, with folding stainless steel buckle. Retail $22,400. OUR PRICE $14,800. Excellent buy! To purchase this watch CALL US 956.687.2981.